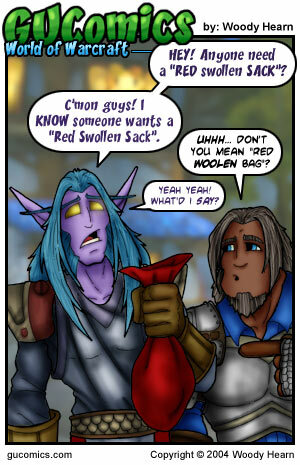 World of Warcraft: "Red Woolen Bag"
There's currently no bazaar system in World of Warcraft. Basically, if you want to sell something, you're stuck hawking your wares in the Trade channel... waiting for people to bid on items. So, yesterday while I was in the market for a new sword, someone was selling a red linen bag. Take a wild guess as to what I THOUGHT I read. Frued would have a field day with THAT mental slip no? Don't worry too much, trade channels are currently "area" specific. So, you don't see the trade chatter from the other zones. 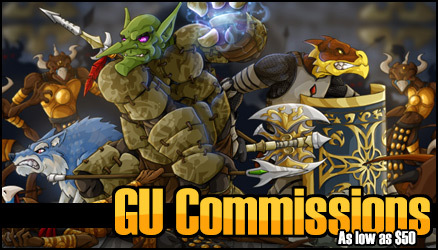 And, if my sources are accurate, you can expect a functioning bazaar system along the lines of SWG or FFXI to be instituted before the game is release. At any rate, I thought I'd share my inability to read, with you. 16 years of education... and I come up with "red swollen sack".